Do you need to trigger emails based on lead or contact activity? Do you want to track those emails — and see whether people open them, unsubscribe, or get blocked due to spam? Through the Salesforce Process Builder, you can trigger email alerts and track a number of data points, all designed to make your email campaign more successful. 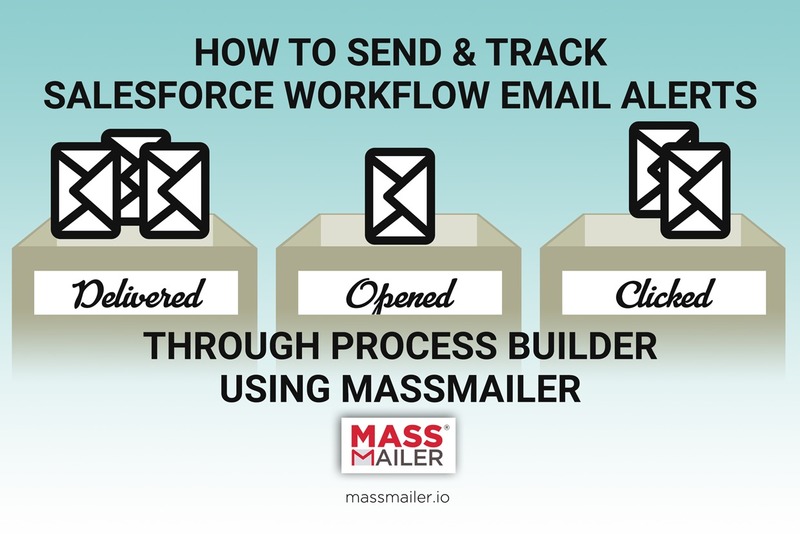 Now using MassMailer, you can send and Track Salesforce Workflow Email Alerts through Process Builder. Triggered email alerts can be setup within minutes from the Salesforce Process Builder. Under the process builder, you are able to define specific situations in which you want an email to trigger — such as the addition of a lead to the list. From there, it’s a simple matter of filling out information about your email: the correct email template, sender and recipient data, BCCs, and CCs. 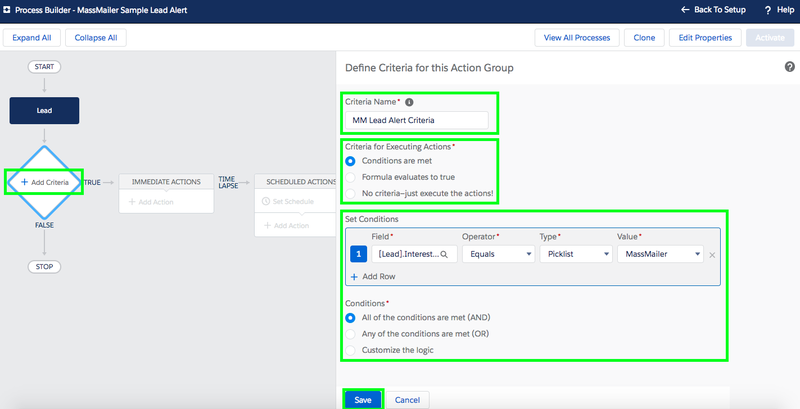 Salesforce email alerts can be triggered based on Lead, Contact, Account, User, and Case objects. They leverage already existing Salesforce email templates, requiring very little by way of customization. It’s one form, and then you’re done. The Process Builder provides dynamic settings, such as the dynamic From email for Workflow email alert in Salesforce, making it easier to set an email’s contact through an automated process. You may also BCC Workflow email alerts in Salesforce or CC workflow email alerts in Salesforce, to ensure that other departments or managers are able to see and review them. Once you engage the Workflow process, emails will be sent automatically upon that trigger. You can track Workflow email alerts in Salesforce by looking at your activity history; this will show the emails that have been sent so far. Users, contacts, and other entities may have automated email alerts sent to them through defined Workflow rules. These alerts may occur when records are changed, a platform event occurs, or another process invokes them. Processes can be started when a record is added, created, or edited, and advanced options can be used to further fine-tune when email alerts will be sent. Conditions and formulas can be set through a simple, intuitive user interface, which can check to see whether ALL of the conditions are met or at least ONE of the conditions have been met. This allows for complex and detailed alerting functions. You can check on these email statuses to determine whether your triggered alerts are successful, or whether there are any bounces or spam reports for the emails sent. If you see a number of emails being marked as spam, there may be something wrong with your email content, or the email list. You can also track the Activity History report on the respective objects you have sent emails to. You can find Step by Step instructions on how to send email alerts to Leads, Contacts, Cases in our support portal at this link. You may be interested in learning how to send and track email alerts to Opportunity Contact Roles as well. Are you interested in sending and tracking Salesforce Workflow Email alerts? 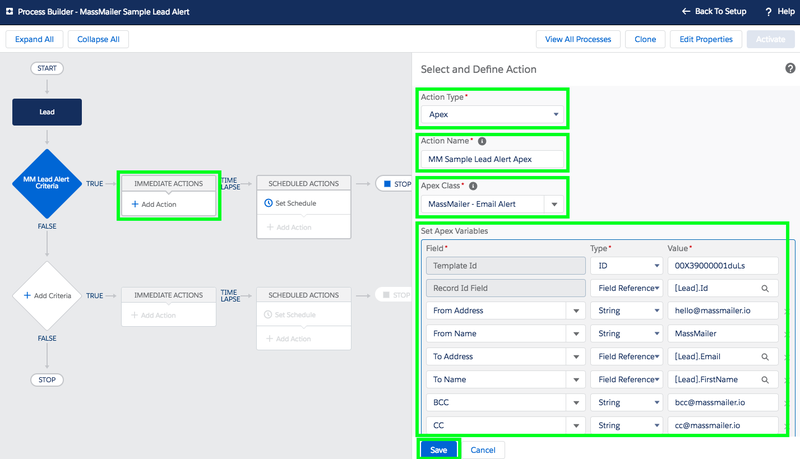 Salesforce Workflow email alerts make it easier to connect to leads and contacts, keeping them engaged and automatically providing them with information they may need. Contact us today to setup a demo of MassMailer, including the Salesforce Process Builder.